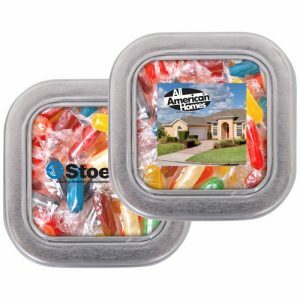 What better way to get on a potential client’s sweet side than to give them some delicious customized candy? Your brand will the be the first thing in mind as they enjoy a delicious treat. 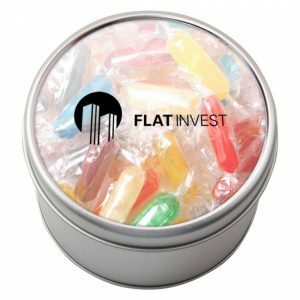 With candy options such a peppermint, butterscotch, and assorted candy rods, there is no problem in finding a way to hit that sweet tooth. Promo Excitement has you covered when it comes to custom candy. 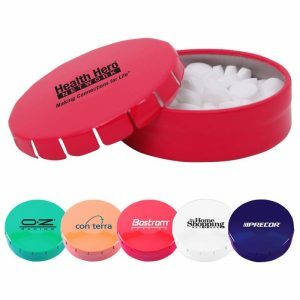 Promote your logo or brand with custom candy tins, custom candy bags, and custom candy wrappers. 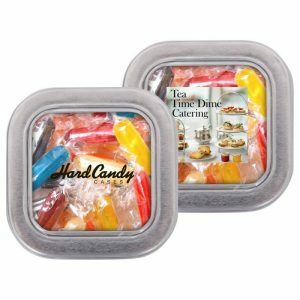 Various candy options are available for each item, so you can choose the best candy to fit your needs. 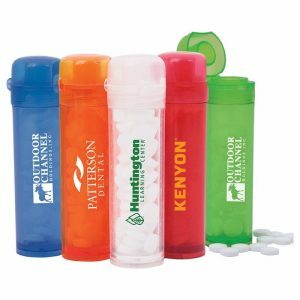 Promotional candy makes a great giveaway item for potential clients, new employees at the office, or even in the community kitchen for everyone to share. Interested in a particular type of candy, but don’t see it listed? Click the chat box below and one of our account managers can assist you in finding the customized candy you need, even if it isn’t listed on our site!